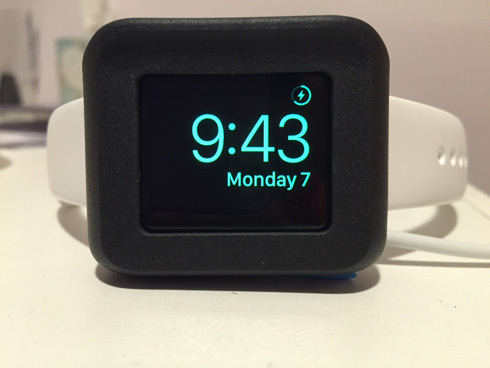 I’ll be honest: when the Timeframe arrived for me to review, my first thought was, “Why would anyone want this?” After a few weeks of use, I must admit, this is a very nice Apple Watch accessory. The Timeframe protects your precious Apple Watch from scratches, dings, and drops, with a tough rubber shell where the watch slides in, and a strong back casing to protect the charger. But that’s not the main reason why I like it; I’ll explain with the photos below. After you slide the watch into your Timeframe, place the watch charger in the circular opening. There are two channels on the back for the charging cord that help keep the charger secure. Put the casing over the charger and you’re done. 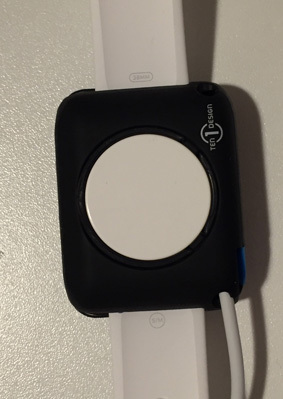 The Apple Watch easily slides out of the Timeframe after charging. If you prefer, there’s an ejection handle that gently pushes the watch out of the case. Using the Timeframe has been flawless. My watch charges every night without fail. In the past I occasionally put the wrong side of the charging disc on the back of my watch, therefore waking up to a watch with very little battery. That problem has disappeared. Plus there’s no worries of the charger slipping off the watch. 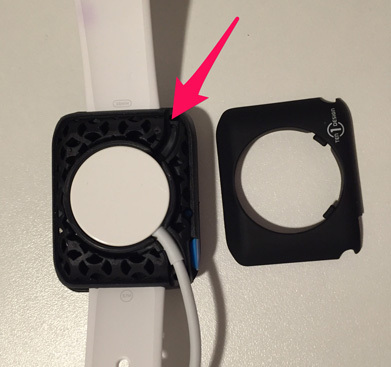 If you use your Apple Watch as an alarm, place the Timeframe on its fully protected side, as shown in the first photo. All buttons are accessible. My only complaint about the Timeframe is that Ten 1 Design didn’t include any instructions on how to use it. Some people may be confused on how to set it up. Timeframe is small and light, which makes it great for travel. Throw one in your gym bag if you need to take the watch off for showering or swimming. I have a few trips coming up this year, and the Timeframe is coming with me.